This story originally appeared in Brain, Child Magazine. Michele is journalist, creative writer, editor, and writing instructor. She lives in Greenwich, CT and manages the consulting firm A Bloc of Writers (ww.ablocofwriters.com). “Santa!” my brothers and I screamed, racing to answer the door on Christmas Eve. Santa Claus stepped into our foyer and handed us each a red mesh stocking filled with sweets. But it wasn’t the presents that we awaited eagerly year after year; it was his presence; Santa right in our home in a small farming town in New Jersey. Santa knew us by name and sometimes even our ages, give or take a couple of years. It made us feel special. He looked as authentic as any mall Santa with a perfectly rotund belly, except he had the shoulders and gait of a linebacker. It did strike us as odd, even as children, that after he emptied his meager bag of candy, Santa would sit down at the kitchen table with my father and drink Scotch. Their banter seemed familiar. We didn’t question their intimacy or the visits, or how Santa could take time out of his busy flight after dark on Christmas Eve. We believed. Until the year I was 9-years-old, and poor Santa had so many glasses of Dewar’s he passed out on the floor of the family room in front of the fireplace. When my parents’ were in another room, my 6-year-old brother, Mickey poked Santa’s stomach. Then Mickey climbed atop the protruding belly and began to surf. Santa didn’t budge. My oldest brother PJ, age 12, and I stared at my brother jumping up and down on Santa’s belly with our eyes as wide as Cindy Lou Who. Then we all took turns jumping off of Santa’s belly and diving onto the brown shag carpet. We giggled, and then howled with laughter. Next, in a daring act of defiance, PJ removed the white beard, revealing what we had long suspected: our annual visitor was my father’s older brother, Frank. Uncle Frank lived in a trailer park about a half hour from our home, and on the few occasions we did visit him, usually on a Sunday drive, it was uncomfortable and awkward for everyone. His tiny mobile home was a fraction of the size of our three-bedroom ranch house, which seemed like a mansion in comparison. I didn’t understand how he could live like that while we lived in such comfort just a car ride away. Every Christmas Day, we joined my mother’s sister and her family for dinner at my grandparents’ house a block away from our home. My grandmother set a formal table, and even the children drank from Waterford crystal glasses. My father was the son of a farmer whose mother died of breast cancer when my father was 6-years-old and Uncle Frank was 8. My father married the richest girl in town, my mother, and her mother did not approve of Uncle Frank or his lifestyle, so Uncle Frank was never once invited to Christmas dinner or any holiday at her house. “What a shame, what happened to him,” was all I ever heard my grandmother say, shaking her head as we sat around a dining room table packed with thirteen of us. I remember feeling sorry for my dad because he spent every holiday with my mother’s family, but I never dared ask why we couldn’t squeeze one more around the table. I learned later that my father gave Santa a little gift every Christmas, and he “loaned” him plenty of other money over the years. I’m still not sure that made up for allowing him to spend Christmas alone. Even now, when I look at pictures taken at my parents’ wedding in 1961, it’s hard to believe that it’s the same man smiling back. It’s still a bit shocking to see the photograph of my parents seated in their car, with Uncle Frank, the best man, on the outside, leaning in. His movie star good looks and seemingly translucent blue eyes, vivid even in the black and white pictures, are what those older folks remember, not the aging alcoholic with a Kris Kringle belly that he’d become. 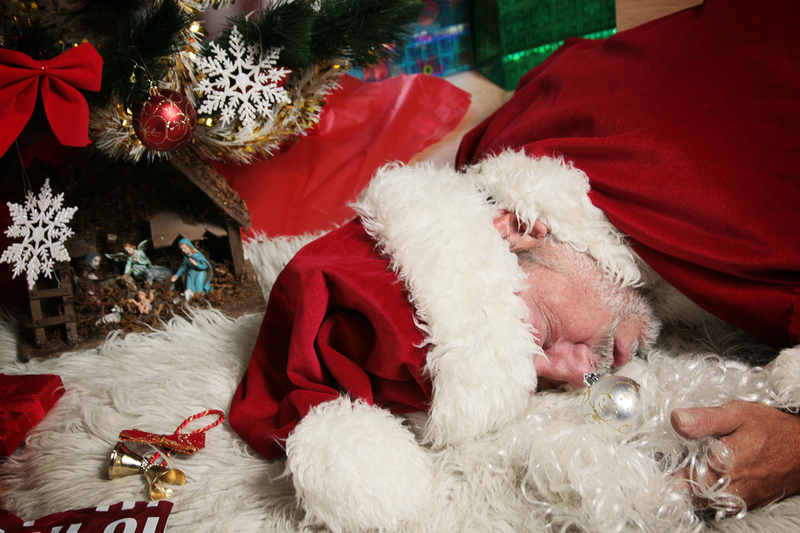 As I got older, I wondered how Uncle Frank had turned into that drunken Santa impostor passed out on our floor. My father didn’t speak about Uncle Frank much, and they grew apart, but I think he loved him for the boy and young man he once was—an all-state football player whose college career was somehow derailed. He ended up working construction, never married and didn’t have any children. I was a senior in college when Uncle Frank died of liver failure at age 55. My mother always blamed “the bar,” a local watering hole my father and his brother owned in the 1950s. I think it had more to do with growing up without a mother. My father had been rescued by my mother, or more accurately, my mother’s father, who gave him a job at his insurance and real estate company. My parents created a family, one whose children believed in Santa Claus, but knew he’s a mere mortal who enjoys Dewar’s on chilly December nights. After Mickey had removed the beard, Uncle Frank woke up, and began to cry. “They know who I am,” he said, over and over. My brothers and I had no idea what to do. We looked at my parents, who were also speechless. I felt immediate remorse, knowing we had ruined Christmas for Santa.